A sales scorecard such as the one above is very useful in showing results, trends and progress towards a target. When set up correctly it can be extremely powerful, and give a great overview of your figures. All you need to do is provide the data, and Target Dashboard will do all the calculations and visualisation. There’s a column for ‘Sales Person’ that we can filter by, we have our date, sales figures, and our target. In this case the target is per sale, and will therefore accumulate throughout the month. In Target Dashboard, we have to make sure that the target column is linked up to the column with the actual sales values, and then we are good to go. No further action is needed to allow Target Dashboard to work its magic. On your Dashboard, select ‘New Other Item’, and click on Scorecard. In the Scorecard builder, pick your data table and column (Sales Value) from the dropdown list, and add one row for each sales person in your team. You will end up with a number of identical rows that shows trend and target for the entire sales team put together. 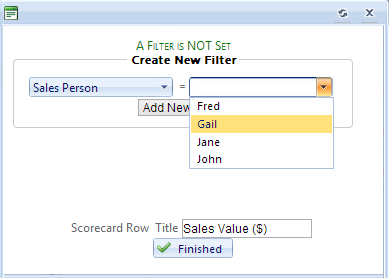 What we need to do now is filter them to display the figures for each individual sales person. Select the column you would like to filter by, pick your filter and add it. Name your Scorecard Row, and click finished. Do this for each of your rows until you have one for each sales person – and perhaps you want a row that shows total team performance as well. For this you won’t need any filters at all. Save your scorecard to add it to your dashboard. As the data behind it is updated, the graphic will change to reflect trend, % change and % towards target. You can now add your scorecard to presentations, reports and weekly emails by a click of the mouse. For More information on monitoring your sales or marketing from a KPI dashboard, take a look at our comprehensive guide. Its got lots of tips on displaying your data in charts as well as scorecards!